Yuca is also known as cassava, manioc, manihot, mandioca, sweet potato tree, and tapioca plant. It is one of the important food crops in the tropics where it is grown for its starchy, tuberous roots. The yuca vegetable or tuber has its roots in the Amazon Basin of tropical Brazil. Its cultivation spread from there to other parts of Latin America thousands of years ago. This crunchy vegetable has a tough brown skin and a crisp, white flesh. Yuca is divided into two categories: bitter & sweet. It is used as a thickener in the making of tapioca. Eat yuca for healthy skin and muscles. Yuca is high in starch, making it a good energy source, and vitamin C which is important for healthy teeth and gums. The yuca also provides potassium which helps in maintaining a good balance of bodily fluids in the blood. It is also a good source of dietary fibre which helps to promote regularity. Choose yuca that is firm and well-formed. Look for tubers that are free of blemishes, with a clean, fresh scent. Store yuca whole in a cool, dark, dry place for up to one week. 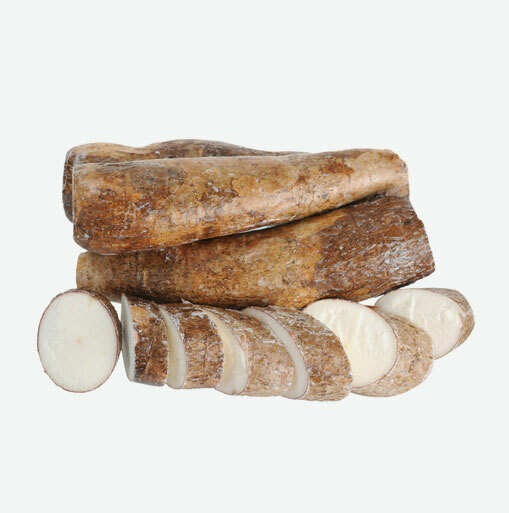 The skin of the yuca root should be peeled and the fibrous core removed before using. Yuca needs to be boiled before eating. It can be steamed, baked or roasted but boiling and steaming cassava are best. When grated, cassava can be used in puddings or included in meat and vegetable dishes. You can add cut yuca to soups and stews. Boil this tuber, mash it and drizzle with garlic sauce. This makes a great alternative to rice.